Most statements of corporate social responsibility focus on the responsibilities of corporate decision makers or their advisors Professor Johnson argues that corporate law professors-the persons who educate the students who will become lawyers counseling corporate decision makers-also have a social responsibility. He believes that professors should find various ways to raise the subject of corporate social responsibility in the basic corporations course, and he advocates rejecting a classroom approach that addresses only shareholder-manager relations After describing several possible ways to do this, Professor Johnson spotlights fiduciary laws as a fruitful area to enrich student understandings of director duties in a way that encompasses socially shared norms of loyalty and care. With broader understandings of those key notions, lawyers may counsel corporate decision makers-and decision makers may act-in a way that results in more socially acceptable and responsible corporate conduct In this way, corporate law professors can fulfill, not abdicate, their own responsibilities. Lyman P.Q. Johnson, The Social Responsibility of Corporate Law Professors, originally published in 76 TUL.L.REV. 1483 (2002). 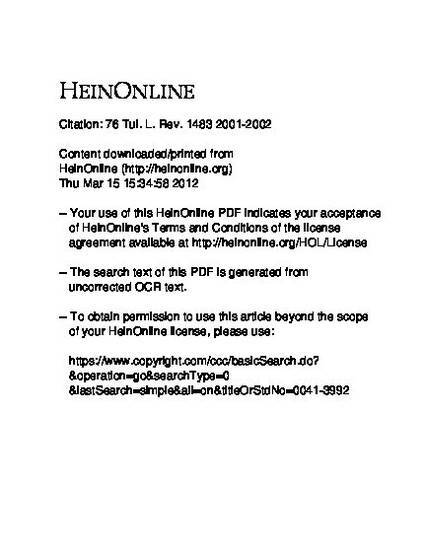 Reprinted with permissionof the Tulane Law Review Association, which holds the copyright. Lyman P.Q. Johnson, The Social Responsibility of Corporate Law Professors, 76 Tul. L. Rev. 1483 (2002).